* Perfectly match to Asus ZenBook Flip ux360CA ! * Keep aesthetic of Asus ZenBook Flip ux360CA and increase the storage! Plug-in-and-Forget BASEQI is a short / low profile Micro SD adapter designed exclusively for Asus ZenBook Flip ux360CA. Just insert Micro SD card and slide in to Asus ZenBook Flip ux360CA SDXC card slot to increase the storage of Asus ZenBook Flip ux360CA. * Unlike traditional long Micro SD adapter, BASEQI Aluminium Micro SD Adapter is plugged seamlessly into Asus ZenBook Flip ux360CA SDXC slot without sticking out. It is almost hidden and invisible from outside. No worry to break Micro SD adapter or SDXC card when you bring Asus ZenBook Flip ux360CA around. * No tool needed! The innovative design (patent pending) makes it hassle free to slide out BASEQI Aluminium Micro SD Adapter with your finger nail. No tool is needed! It is handy to swap Micro SD when you are outside. You won't struggle to use a paper clip to take it out or worry where to keep the small tool. * Please note the product does not include Micro SD card and Asus ZenBook Flip ux360CA. The photos are for illustration only. Simple & Easy to adding storage space, Add up to 400GB of extra space. Completely hidden and fits snugly into your Asus ZenBook Flip ux360CA SD card slot. 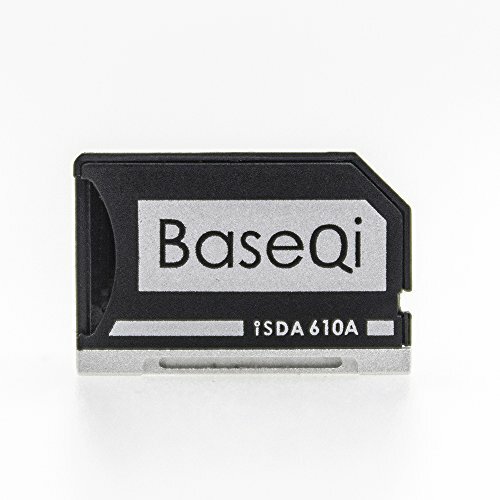 If you have any questions about this product by BaseQi, contact us by completing and submitting the form below. If you are looking for a specif part number, please include it with your message.